We would not normally have collected this, since it is really just a (not very interesting) foundation stone, but we were pleased to have spotted it and went to a lot of trouble to photograph it so that we could read it. We could not then bring ourselves to discard it. And there is a little mystery, since the plaque is attached to the wall rather than built into it, and the date of the building is 19th century rather than 1931. Which suggests that Walton's Ltd didn't build the building but moved into it and then put up the plaque - an unusual thing to do. However, via the Independent, we have now learnt that at 27-29 Long Acre (in 2012 occupied by H&M) the other side of Covent Garden tube station from this site, there is a handsome early/mid 20th century building with a ghost sign reading "London's favourite fruiterers, T Walton & Sons (London) Ltd." That identifies Walton's trade (not surprising, given the location) and also, sort of, explains the date, 1931. 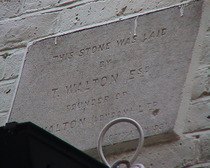 Possible scenario: Walton founded the business in the old building, built it up to be so successful that he could move into a new modern building and erected a plaque on the old one as a farewell. We're not totally convinced but can you do any better? Incidentally: the modern building was used by St Martin's School of Art, 1979-82. "The architects re-used the letters left by the previous owner making the extras needed to re-sign the frontage, spelling out Saint and dropping the apostrophe before the 's' in Martins". 2012: Deborah Hart Stock has done some extensive research into this company and when it occupied which addresses; see the T. Walton page at right for a summary. Following on from this work her favoured theory to explain this plaque is that Thomas incorporated his business in 1921 (probably 18 March) and 10 years later the business was so successful that he, rather boastfully, erected the plaque in celebration of the firm’s first decade. We find that pretty convincing. This plaque is made of a single piece of cast iron.